Analysts have warned for years that Old Age Security (OAS) and Medicare is unsustainable given our demographics. The federal universal health care system was enacted with legislation by Lester B. Pearson in 1966, during a time when each woman had an average of pproximately 3 children. See Figure 1 Below. In 1966, that economic model made more sense. 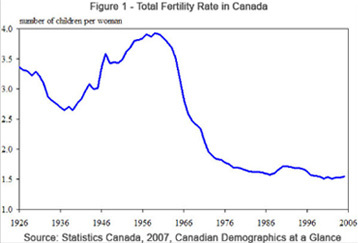 It was based on the birth rate which inevitably dictates the number of workers who end up paying taxes to support social programs, like our publicly funded health care system and OAS. However, the model no longer works because the numbers have changed dramatically. 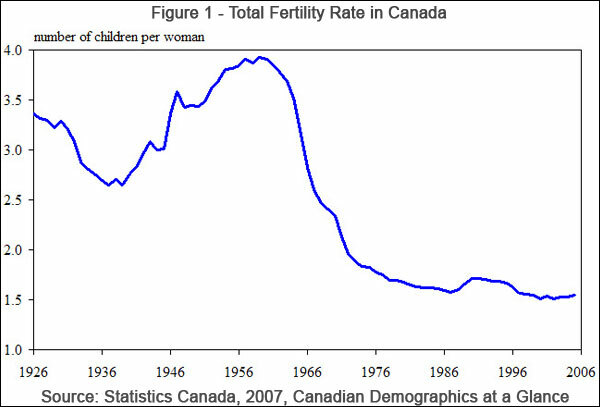 After the widespread societal acceptance of contraception, followed by the legalization of abortion, Canada’s fertility rate fell steadily and dramatically to 1.61 children per woman as of 2011. This resulted in a corresponding fall in the ratio of Canadian workers to pensioners which proved economically disastrous. See Figure 2 below. The dangerous fall in the birth rate, a consequence of contraception and abortion, has directly decreased the ratio of workers (who pay taxes) per pensioner (who receives taxpayer-funded medicare, OAS, etc.) That ratio has been decimated since 1966. 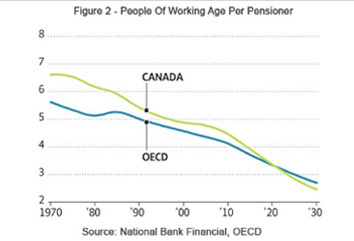 In 1970 for example, Canada had almost 6-1/2 workers per pensioner. Today there are barely 4 workers per pensioner. The decline represents a roughly 38% reduction in the proportional number of workers. By 2030 the ratio is projected to be approximately 2.5 workers per pensioner. This means that our universal health care system (i.e. Medicare) and public retirement income systems are unsustainable. It is a major economic and social crisis which immigration alone cannot solve. Why is it that immigration alone is inadequate to solve the looming Medicare and public pension crisis? It boils down to age and taxes. Let’s use an example of a 50 year old immigrant who comes to Canada, starts working immediately, retires at 65 and then dies at 85. This means he will have contributed into OAS and Medicare via payroll tax deductions for 15 years, and then received taxpayer-funded benefits through his retirement for 20 years. By contrast, a young person born in Canada who starts working at age 22, retires at 65 and dies at 85 will have used up taxpayer benefits for the same 20 year period, but contributed through his payroll tax deductions for 43 years. That gap in lifetime tax contribution is the key. 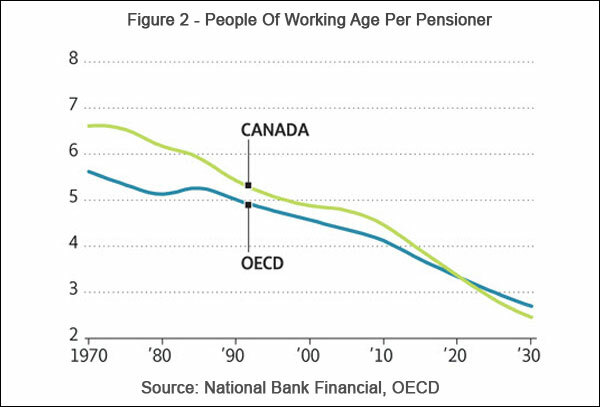 The reason why we have an impending public pension and Medicare implosion problem is quite simply that Canada has too few workers per pensioner. Fortunately, the solution is also simple albeit long term. That is, we have to eliminate abortion, discourage contraception and encourage a higher birth rate.